EXCEPT FOR PRIVATE PARTY BOOKINGS 10* PEOPLE OR MORE. In the winter 2019 @ AMIGOS the kitchen will be closed except for private parties. Remember to check out the best steaks in Benidorm, our full menu and vegetarian options. To reserve a table complete the form on the right. Prices are listed on the right of the menu item except for the steaks where price is determined by size and type and range between 20 and 40 euros. Gluten free bread available but must be pre-ordered. Served seasonal fruits with bread and butter. tomato on the vine with a homemade pesto drizzle. Grilled and served in a caramel liqueur or soaked in honey with side salad and bread. Served with a whisky and mushroom sauce and a shot of Jack Daniels whisky. 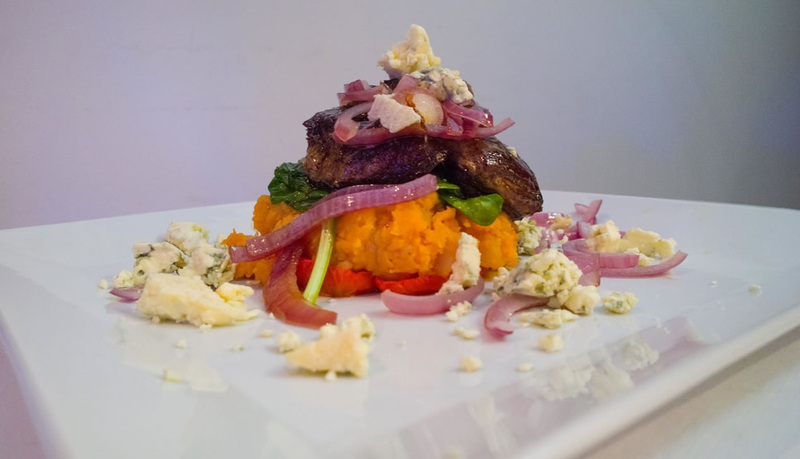 Roasted red pepper stacked with sweet potato mash, garlic spinach, fillet steak, caramelized red onion and crumbled blue cheese. Prices for these premium Galician fillet steaks range between 20 and 40 Euros varying by weight and variety. Please ask server. Roasted red pepper stacked with sweet potato mash, garlic spinach, atlantic salmon, caramelized red onion, atlantic prawn and crumbled blue cheese. Roasted red pepper stacked with sweet potato mash, garlic spinach, chicken breast, caramelized red onion and crumbled blue cheese. Myself and my sister visited Amigos on the last night of our holiday in Benidorm, we'd found this place on TripAdvisor looking for a nice place to go as a birthday treat. Amigos didn't disappoint. It's tucked away up an alley way in the old town and I doubt we would have found it by simply wandering around. It made a great change from the something and chips we'd been eating everywhere else we'd been. The food was tasty and well presented. The wine was good too. Try the garlic mushrooms - probably the best I've ever had. It is more expensive than the something and chips places - but you have the expect that. I didn't think 70 something euros for 2 people, 2 courses, 2 glasses of wine and a jug of water was all bad. If I'm in the area again would return without a doubt.